The photograph of the Trump rally in Loveland, Colorado stopped me in my tracks as I was scrolling through my Facebook feed -- a black and white piece of photojournalism that reminded me of one of my favorite photographs, Diane Arbus's "Patriotic Young Man With Flag N.Y.C. (1967)," the iconic image captured at the height of the anti-Viet Nam war frenzy. In Arbus's photograph, the lighting is harsh and unsparing. A pale-eyed young man with acne-flecked skin and bad teeth sports an "I'm Proud" American flag pin. The haunting impression left with the viewer is one of a fanatic in a moment of ecstasy, and the viewer is invited to contrast his "I'm Proud" flag pin with the other component parts of his presentation: his dishevelment, his apparent poverty and the overall sense of disenfranchisement. As a photograph, Arbus's 1967 image is a stunning piece of storytelling, and while there are objective grounds to find it ugly, or chilling, I've always found it beautiful, and weirdly noble. It should look contrived, but it doesn't. The lack of self-consciousness on the part of the young man is poignant. He appears to be saying, "Here I am, this is me, this is what I believe, and this is my America." The viewer is left to assess the reality being depicted. For a cruel viewer, there is plenty to mock. For a thoughtful viewer, there is ample opportunity to compassionately evaluate the jarring contrast between boy's message and the reality the image presents, and to ask how the circumstances leading up to that moment came to be. 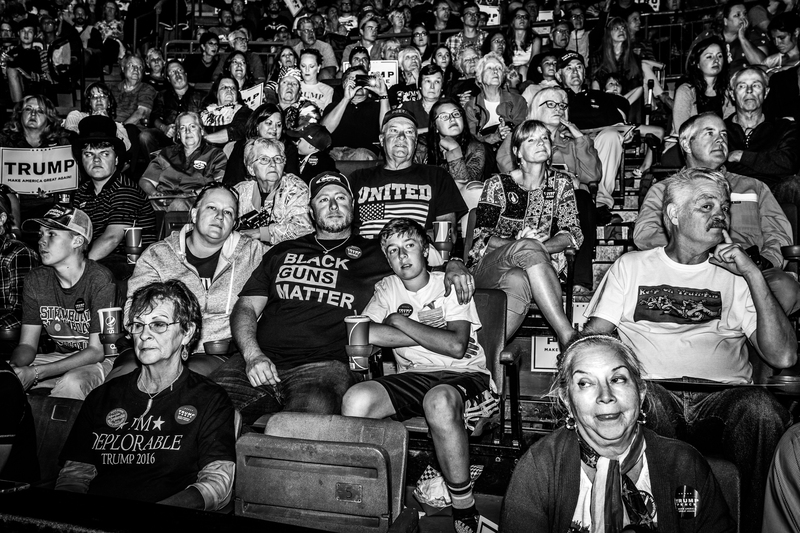 The 2016 photograph of the Trump rally -- shot by Seattle-based photojournalist Nate Gowdy, who rose to national fame this year when one of his campaign shots of Bernie Sanders made the cover of TIME magazine -- is unlike the Diane Arbus photograph in several ways, not the least of which is that it's not a portrait but rather a superb piece of reportage. The assembled Trump supporters are not posed against a white backdrop -- Gowdy shot upward into the crowd. Though the image is spontaneous, by definition, uncontrived, each face speaks volumes, and the natural arrangement of their bodies recalls a Renaissance painting with each character's face and body playing a part in telling the painting's, or in this case photograph's story. It's about the story of America on the cusp of the most vicious and divisive election it its history. Except, as it turned out, it was less the photographer's story than it was the story of the people in the photograph, and the story of America on the cusp of the most vicious and divisive election it its history. I posted the picture on my Facebook page with this note: To my mind, this photograph by Nate Gowdy, of a Trump rally in Loveland, CO, on Oct. 3, 2016, is Pulitzer-worthy. Without a single letter of copy, it tells an entire story. Though my page is private, on a hunch, I adjusted the privacy setting to "public." What happened then was extraordinary. Within a matter of days, the photograph had been shared over five thousand times from my page. The "Reactions -- anger, shock, etc. -- reached 4,500. The comments themselves -- which you can read by going to my Facebook page, as I plan to leave them public until the day after the election -- eventually totaled almost two thousand expressions ranging from awe, to rage, with everything in between. My first reaction on reading the comments was an ethical double take. While many of the commenters immediately noticed the uniformity of the white faces, I realized that my own privilege, as a white man who was raised in comfortable upper-middle class circumstances, had caused me to entirely miss that on first glance. Given the fact that Trump's dazzling appeal to lightly educated white voters is as much a matter of record as the campaign's apparent antipathy toward minorities, it seemed natural to me that the photograph should be as it was. Used to seeing my own skin color in pictures, I had been spared the reflexive jolt of "otherness" that African-Americans and Latinos endure as a matter of course. In short, I had the luxury of exploring the photograph as a portrait of class and politics first, and everything else second. Much was made by the commenters about the racial breakdown of Loveland, Colorado, as though the reason for the absence of people of color in the photograph was simply a matter of happenstance, instead of a stunning comment on Trump's target demographic and, more importantly, why they are his primary demographic. Centered in the photograph is a man with his arm around his son, his wife leaning in at the viewer's left. He's wearing a t-shirt with the logo "Black Guns Matter," an ugly pro-gun logo that deliberately plays on "Black Lives Matter" while bringing gun rights into a discussion by default. I "met" the man in the picture when I intervened regarding some ugly barbs aimed at his teenage son. Although I moderated the post very lightly, I did remove egregiously vile comments from both the pro-Trump and anti-Trump faction, and I considered attacks on the boy -- ranging from his looks, to his intelligence, to what the commenters imagined his views to be on race and religion -- to be infra dig due to his age. I sent the man a private note and apologized for the comments he and his wife had seen about their son. I noted that while he and I would likely agree on nothing politically, attacks on his son were unacceptable, even in this otherwise eruptive discussion. He replied courteously, thanking me for my concern. "Just so you know," he added, "My shirt is about firearms safety, not racism. It is also mocking the BLM movement as the rest of our country has seen it is not about saving black Lives at all. Thank you and you have a great weekend as well." He and his wife also made comments to this effect throughout the thread, as well as in the comments sections of other sites where the photograph was reproduced, all of them calmly and articulately expressed without rancor or aggression. To them, this made complete sense, as did the notion of self described "conservative Christian Republicans" voting for a politician whose well-documented life is, in most ways, the antithesis of red-letter Christianity by any objective standard. The organization Black Guns Matter was founded by an African-American NRA member named Maj Toure, with the aim of providing firearm training and education to African Americans. It has been covered extensively and favorably on alt-right websites. Its existence and legitimacy as a pro-gun organization isn't in question, even though many of the commenters had not heard of it, nor, I confess, had I. What was in question, however, was the motivation behind the t-shirt being worn by a white man at a Trump rally in Loveland, Colorado, particularly when the man in question candidly admits that he's wearing it to mock Black Lives Matter, an organization that was founded specifically in reaction to the killings of African-Americans by white law enforcement officers, vigilantes and others. Whether or not the man wearing the t-shirt considered himself racist, the act of a white man wearing it, particularly in the context of a political rally for a candidate whose campaign has been endorsed by white supremacist organizations, who has made racist dog whistles a regular occurrence, is, by default, racist. Gowdy's image, though literally a snapshot in time, derives its power from the fact that it has stripped the people in it to their essences. Like the older woman wearing the "I'm Deplorable" t-shirt, itself a reference to Hillary Clinton's quite accurate commentary on the Trump campaign's attractiveness to racists, homophobes, misogynists and bigots of every stripe, the act of jauntily sporting a t-shirt identifying oneself with these characteristics, tells a truth by default, whatever anyone says to the contrary. I have no doubt that the people in the photograph -- like the man with his arm around his son -- attend churches love their families, love their country, and think of themselves as good, patriotic, decent Americans, but the facts are what they are, and that is occasionally one of the differences between photojournalism and posed portraiture. That disconnect, in essence, is reflected throughout the photograph. It's not a photograph about racism. The genius of Donald Trump's campaign is that he has successfully channeled the worst aspects of the American psyche -- greed, resentment, rage, intolerance, bigotry, misogyny, racism, xenophobia, and rancid nationalism -- and repackaged them as patriotic virtues. He has done so in a way that opens infected wounds that have been festering for more than two centuries, calling it "making America great again." Worst of all, he has sold it back to a segment of the population who are genuinely suffering from lack of work, lack of education, lack of healthcare, lack of opportunities, and he has convinced them that a dog-whistled "other" is responsible for their woes and, in a way that chillingly recalls Germany in the 1930s, that he is the only one to save them. Like Arbus's famous "Patriotic Young Man With Flag N.Y.C. (1967)," Gowdy's photograph invites the reader to evaluate the subject. Unlike Arbus's photograph, however, the reportage in Gowdy's image adds additional weight to that evaluation, because its honesty and candidness forces viewers to look for a reflection of them. Some of the commenters found it -- they were generally the ones who saw an image of homespun, folksy Americans exercising their right to participate in the political process. The ones who didn't saw a crowd of "deplorables," to whom they were prepared to ascribe any number of vices and counter-virtues based on their faces, their clothes, their bodies, and their presence at a Trump rally. In both cases, the "othering" in the comments -- either of the people in the photograph, or of the people critiquing them -- points to the schismatic theme that has run through this entire election, and which has revealed more about America's uneasy relationship with gender, class and especially race. Gowdy's image, though literally a snapshot in time, derives its power from the fact that it has stripped the people in it to their essences, if only for a nanosecond, and invites the viewer to see themselves. Where some see the wholesomeness of a brave people who are watching everything they know and trust vanish, others will see deadened, hardened faces, and toxic Americana. Somewhere between those two poles is a vast social truth that no one photograph can ever entirely convey, but which, like this one, the best of them illustrate in shattering increments. This essay first appeared on The Good Men Project.